Building the new organ for St. Mark's Church has been a singularly rewarding experience. As the oldest Lutheran parish west of the Mississippi, St. Mark's has long been recognized for its rich German heritage. In respect of this it seemed fitting to build an organ which would focus without compromise on the great musical tradition of the Lutheran church. While the history of the European organ reaches back well over a thousand years, no influence on its development has been more profound than the arrival of the Lutheran Reformation and its invention of vernacular hymnody. In the earliest days the faithful converts sang so lustily that they needed no accompaniment. Only gradually did the organ find a new role in leading the congregation in its hymns. Through this identity with the people's song the organ and its music flourished, so that by the 18th century the instrument had reached heights of unsurpassed refinement and beauty. It is to this tradition that many organbuilders today turn for inspiration. Thus, every aspect of the new organ for St. Mark's, from its design and construction to the voicing of its pipes can be traced to the surviving examples of 17th and 18th century organs of the Lutheran church. It is the clarity of this mission which gives the St. Mark's organ its unique identity in the Bay Area. The organ's path from our shop to San Francisco was a curious one. Although it was ready for delivery in 2002, the retrofitting of St. Mark's for earthquake protection was still years in the future. Storage was considered, but this was not an attractive option, for organs do not fare well when they are not assembled. As it happened, the Presbyterian church in Lexington, Virginia had lost its organ to fire two years before and following its interior renovation was awaiting arrival of a new instrument in 2006. Through remarkable coincidence the suggestion was made that the St. Mark's organ might serve the parish in Lexington until the renovation of St. Mark's was complete. Happily the organ found a temporary home in Lexington until both churches could take possession of their new instruments. The music of an organ begins with its wind. 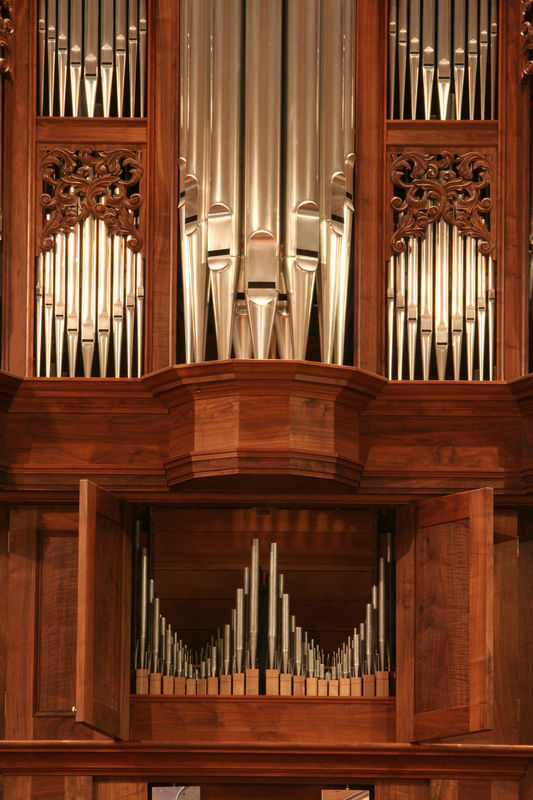 Some musicians object to modern organs because they find their sound harsh and sterile. A cause of this problem often lies in the wind. More than in any other instrument the unique vocal timbre of an organ's pipes can approximate the sound of singing, and like any good singer, pipes need the support of proper breath to sing well. There must be ample wind from the bellows (or lungs), but it should not be inflexible lest the singing be unmusical. To create the desired effect it is necessary to allow pulses set up between bellows and pipes to be heard, like the inflections of a singer. Here wind is supplied by three bellows mounted in a rack behind the organ's case. Although they are usually inflated by an electric blower, the organ sounds best when the wind is raised by foot pumping. Such a traditional wind system makes the organ's music more lifelike and endearing. Organs are often so large and technically complex that many view them as beyond comprehension, but this need not be so. Understanding the design and function of a classical instrument begins by examining its outward appearance. Like its predecessors this organ has a freestanding wooden case, housing its pipes and playing mechanism, which in turn defines its architectural form. The case and its carvings are made of solid black walnut. The most important pipes in the organ are given a place of prominence in the façade. They are made of tin and belong to the family of pipes known as the principals and produce the unique tone we associate with an organ. Other stops, belonging to flute, string and reed families complement the principals with a variety of timbres and pitches. When combined by the player in countless ways they create a tonal palette of great variety. The interior metal pipes are made of alloys containing a higher percentage of lead than the façade principals. The technology required for casting, shaping and soldering organ metal was developed by the Romans for plumbing and has changed little since that time. 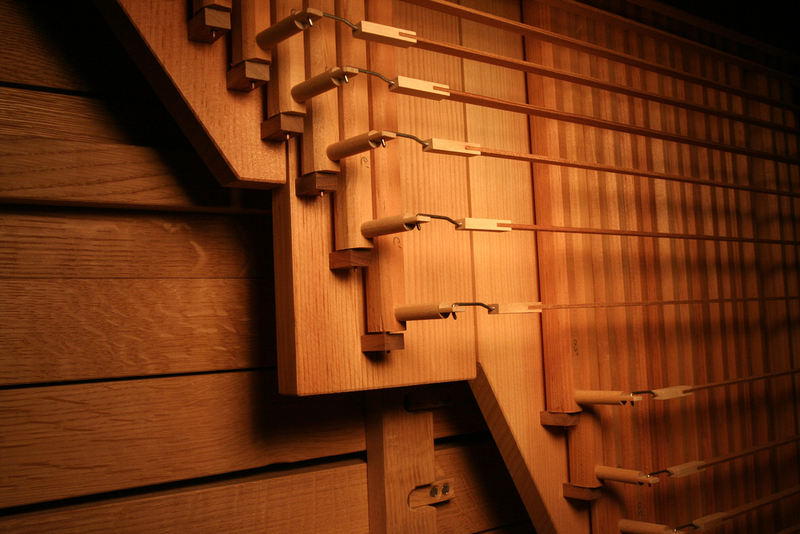 Several of the stops have pipes made of wood, which has been selected for its structural or tonal properties. Altogether there are 2,016 pipes disposed on two manuals and pedal. The instrument has a mechanical playing action and stop action, as did all organs until the latter part of the 19th century. 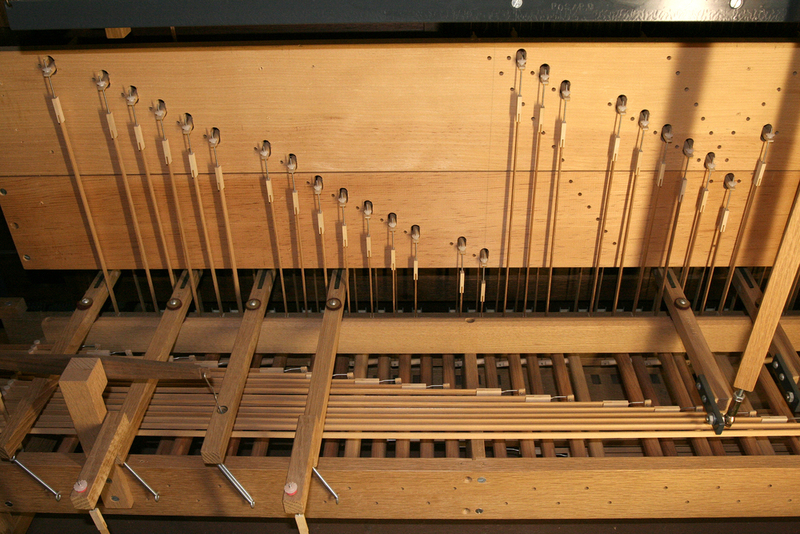 Direct linkage between the keys and their valves is made by thin strips of wood called trackers, hence the term tracker organ, which distinguishes this type of construction from those employing more recent developments. Tracker organs are valued for their longevity and the artistic responsiveness of pipe speech to the player's touch. Another crucial element of musical effect is the organ's tuning. For the past two centuries it has been customary to tune all instruments in equal temperament, where each semitone is made an equal interval. By contrast, early music depended on unequal intervals for its vitality and beauty, exploiting varying relationships of consonance in different tonalities. The matter becomes critical when building an organ with brilliant mixture stops customary in the 18th century. For this instrument we have chosen an unequal temperament particularly well suited to the works of J. S. Bach and his contemporaries. With few exceptions the innumerable parts of the organ were designed and constructed from raw materials in our Virginia workshop. The art of organbuilding demands many skills. It provides a robust framework for working with one's mind and hands, engaging the imagination as do few vocations in our day. We are grateful for the opportunity to practice our craft in this historic setting. It has been an honor for us to be chosen for this project. In this spirit we present the instrument to St. Mark's and the San Francisco community.